Many of the twin-screw extruder users are concerned about the popular High-Chromium Ω101A oval liner which is popular and famous in China these years, asking its physical properties as well as research & development background, let's have a look at what kind of material it is. 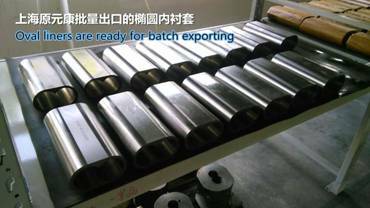 The high-chromium white iron alloy has three special properties, first is the high wear resistance performance, the molybdenum and manganese alloy elements to be added in the chromium and vanadium material will refine the structure, help to form the stabilize carbide and martensite inside of the material. And these carbide particles are with high hardness and wear resistance, such as the vanadium carbide is HV2800, and the antimony carbide hardness can reach HV3200. Even the hardness of chromium carbide (FeCr 7C type carbide) which is segerated from the chromium white cast iron is with a highest hardness. The basic structure of these carbides material can be turn into a martensite structure after a certain heat treatment, and will be with an excellent wear resistance. In all these special properties, the main performance of high-chromium white iron alloy is its high wear resistance, but it also carry a material defect of high britlleness at the same time, this is its second special property. While it is under a cast condition, it has a pretty higher proportion of retained austensite. To dissolve these retained austensite to precipitate the secondary carbides and transfer to be a martensite as much as possible, in order to get a higher hardness, normally a chilling method will be adopted. After processed with this chilling method, finally inside the high-chromium white iron alloy, a high proportion of eutectic cementite and quenched martensite will be formed inside, yet still a little retained austenite will be left inside the metallographic structure. The formed high ratio of eutectic cementite and quenched martensite, and a little retained austensite structure inside the high-chromium white iron alloy after above certain process, inevitablely lead to material of high brittleness, which means the high-chromium white iron alloy can not be used to make a wear parts which will be under a high impact working condition. To reviewing the exturder working condition, generally there is no any high impact or any strong collision, that is the main reason why we decided to use a high- chromium iron alloy to be the material of the oval liner for the segment barrels in those years, and really without any worry. Experimental data tells us that when a sample of high chromium cast iron Ω 101A is under a cast state with a hardness HV572, material impact toughness can achieve KV1.9 J; But when a Ω101A sample is under quenched state with hardness HV910, material impact toughness is only KV1.2 J, That is the evidence of the above analysis regarding brittleness. The high chromium cast iron Ω 101A oval liners have been entered into the market more than ten years, a lot of practice in so many years tells us a simple truth that our oval liners have no any cracking phenomenon during they working process if without a high impact or intense collision .But when it is used in a large-scale co-exturder working conditions, such as the inner diameter is bigger than 200mm, we found that an oval liner which sets at the end of the extruder, was cracked, but other oval liners are safe and sound which are in stalled on all the other barrel sections. Thus we analyse that the crack was resulted from the working state of the screw which is 1.45 tons and installs inside of the barrel cantilever. The screw end hits the barrel wall, the brittle Ω101A oval liner is unable to bear such a big crash and the stress released, led to the cracking. In the history, three Ω101A oval liners with different specs, together with three referenced oval liners made from high speed steel, to be put into a furnace and to be heated to 600℃, to be kept under this temperature for a few hours then to be cooled to the room temperature, we tried to find oval liner size changes, as well as they location degree changes like its ID cylindricity and outer arc by a precision measuring instruments, even other slightly possible ones. Conclusion is we did found any slight changes of HSS oval liners in size and location degree aspects, but did not found any change of the cast iron Ω101 A oval liners in the size and location degree. This experiment still verifies us that the performance characteristic of the cast iron, that to compare with the wrought iron and steel, under a proper temperature any kind of cast iron will not be “plastic deformation”. If a cast iron is destroyed, or "cracked directly ", or "snapped", all is due to its "brittleness", this is a very significant characteristics of it. To check other Ω101A oval liner characteristics in detail, please have a reference of our file [Information of 101A Fe-base Oval liner]. In recent decade years, we were started from a single forming technology of precison casting with simple machining method using the conventional machine tools to make the Ω101A oval liner, now then we are able to make more kinds of oval liner, such as high vanadium iron Ω102A oval liner with super-hard high abrasion resistance, such as the aluminum alloy coated SiC ceramic composite oval liner, and solidity state HIP(High temperature and hot Isostatic Pressing) oval liners..., and we are able to adopt CNC machining center as well as CNC grinding machine with four axis combine movement to make the oval liners.This a difficult way and a keep-ahead way is always inseparable from the German Corpeion Group, is always inseparable from other overseas famous industry leaders, is always inseparable from their inspired and strict requirements, this always encourages us continuously research and development, constantly us to be bigger and stronger. 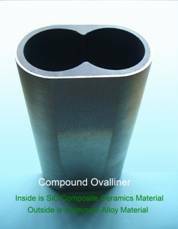 We have worked diligently to promote the developement of the oval liner from its material to the processing technology way. Here we sincerely welcome various kinds of valuable opinions and suggestions from the experts of the industry.